Green shirt or blue shirt? Feeding the ducks or going on the swings? Olly finds it so hard to make decisions! 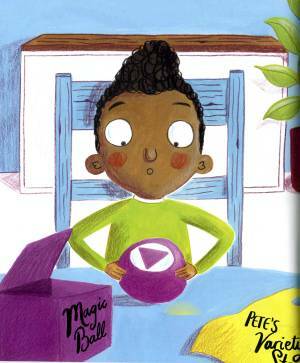 Magic Ball is a book by Anne Fine for younger children and is illustrated by Matt Robertson. It was published on 7th September 2017 as a Level 2 Reading Ladder title, perfect for readers who are growing in confidence and are beginning to enjoy longer stories. 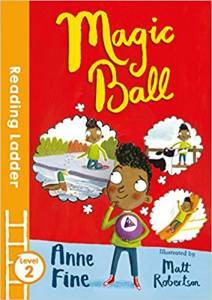 Click the logo to order Magic Ball from or oder it from any bookshop or library (ISBN: 978-1-4052-8455-4). One of my grandchildren went through a very tiresome stage of being almost pathologically indecisive. He couldn't decide if he wanted sauce on, or beside, his pasta; the chocolate or the vanilla; the blue shirt or the grey. You weren't allowed to pick for him. "I'm old enough to choose for myself!" But he just couldn't. He got so horribly frustrated, everyone felt so sorry for him - even his exasperated parents. "Let us choose for you." "No! I want to choose!" "Well, do it, then. We haven't got all day." "I'm trying. I just can't." On and on, as often as not along with wailing and tears. Then someone bought him one of those toy fortune-telling balls. They have a dozen assorted answers floating around inside. You ask it a question, shake it, and read whatever floats up to show in the window at the top. It was astonishing how often the answer that floated to the top seemed to satisfy Robbie. "Do I want to go to the park?" "Well, do I want to go to the playground?" "If I go, will I have a good time?" It worked a treat. Though Robbie knew the ball wasn't magic, just a clever toy, he completely relaxed. Sometimes he did what it suggested. Sometimes he didn't, presumably because at heart he knew it was giving him an answer he didn't want. The Magic Ball did seem, in a rather strange and unhinged way, to work as a cure. His indecisive stage was very funny, even if tiresome. But how it came to an end was even funnier. Do read the book and find out.